oo promoters display a wide range of activity depending on the metal and counterion present. The order of reactivity among promoters with glycosyl halides was experimentally determined to be AgOTf > Ag2CO3 > silver salicylate > HgBr2 > Hg(CN)2 . Generally, the more reactive silver promoters furnish higher stereoselectivities than the mercury salts, but give lower overall yields. In the majority of cases examined, the compound of choice was the most active promoter, AgOTf, or the least reactive, Hg(CN)2. Glycosyl halides are the typical sialyl donors in these processes. Sialyl chlorides are generally less reactive than bromides, but they are not as susceptible to decomposition and are sufficiently active under silver ion promotion to make them the most common halogenated glycosyl donor . Sialyl fluorides are useful for glycosylation reactions but are usually activated under Lewis acidic conditions. 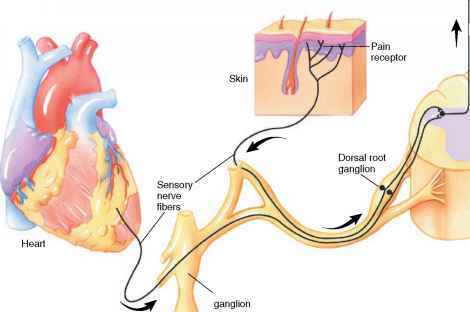 An advantage of using fluoride glycosyl donors is their inherent preference to form ¡-glycosides. Under Koenigs-Knorr conditions, ¡-sialyl chloride 13 leads to predominantly the a-glycoside 15 in a glycosylation with primary alcohol 14 [7a]. 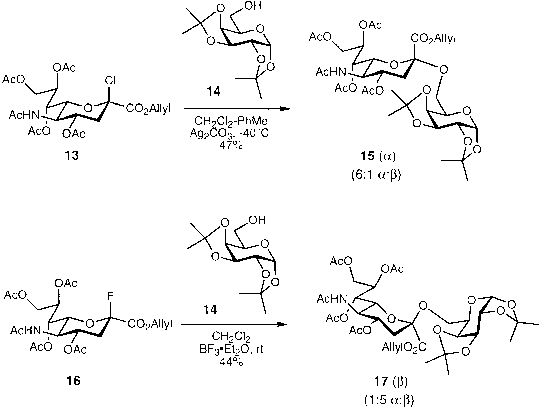 However, when the ¡-fluoride 16 is activated with BF3 • OEt2, the ¡-glycoside 17 is afforded in a 5:1 ¡3:a mixture of anomers (Scheme 7). when more hindered secondary alcohols are employed, the greater steric bulk of the nucleophile leads to lower stereoselectivities and yields. This is an important factor because many naturally occurring sialosides contain linkages to secondary alcohols. Sialyl bromides can be employed as more reactive donors in these instances. As a representative example, Paulsen and Von Reessen used a sialyl bromide to apply the Koenigs-Knorr method to the synthesis of an a-2,3-linked disaccharide (Scheme 8) [7b]. Glycosylation of the galactose acceptor 19 with sialyl bromide 18 led to the desired disaccharide 20, although with poor stereoselectivity (ca. 1:1 a:5). The low yields of Koenigs-Knorr glycosylations with secondary alcohols are partly due to elimination of the sialyl halide and formation of the 2,3-dehydro derivative 21. Many of the methods of activation using Koenigs-Knorr conditions require heterogeneous promoters and long reaction times at room temperature. In addition, the expense and toxicity of silver and mercury makes these methods impractical for large-scale syntheses. Consequently much research has focused on the development of glycosyl donors that could be activated at low temperature, under mild conditions, and without the need for heavy metal promoters. Sialic acid thioglycosides, although initially synthesized for use as biological probes, have been found to be excellent glycosyl donors. Hasegawa and coworkers utilized thioglycosides in the synthesis of several a-2,3- and a-2,6-linked disaccha-rides. The methylsulfide donor 22 was activated by using the thiophile di-methyl(methylthio)sulfonium triflate (DMTST) at — 15°C in the presence of either acceptor 23 or 25 to provide compounds 24 and 27, respectively, as exclusively the a-glycosides (Scheme 9) . High stereoselectivities were observed for these gly-cosylations when the reactions were performed in acetonitrile, even though the thio-glycoside starting material was a 1:1 mixture of anomers. This finding suggests that the stereoselectivity was not derived from the donor configuration as in Koenigs-Knorr glycosylations, but must depend on the reaction conditions. In an attempt to determine the source of the stereocontrol, Sinay and coworkers examined glycosylations of the xanthate donor 27 in polar and nonpolar solvent systems (Scheme 10) [9,10]. Glycosylation of 28 in acetonitrile under DMTST activation afforded the a-2,3-linked disaccharide 29 in 26% yield as a 7:1 a:@ mixture of diastereomers. However, the same reaction in CH2Cl2 gave exclusively the glycoside 30 in 25% yield (Scheme 10). The major by-product in both reactions was the 2,3-dehydro NeuAc derivative. 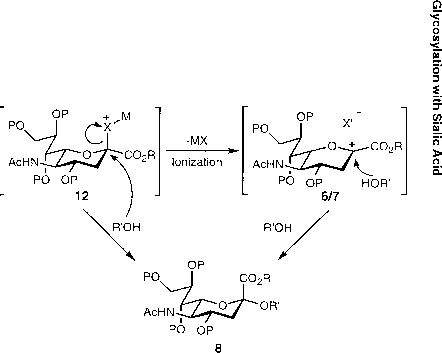 Sinay proposed that the glycosylation in CH2Cl2 probably involved an oxocarbenium ion 31 that underwent axial attack to form the 5 product (Scheme 11). However in acetonitrile, formation of a ¡-nitrilium intermediate 32, which undergoes SN2 attack to afford the a-glycoside, may be the stereocontrolling element. The effect of acetonitrile has been studied in glucose and galactose systems, where the presence of axial nitrilium ions was supported by trapping and spectroscopic studies, both performed at low temperatures .